I have been teaching for many years and recently became Suzuki Certified! Experienced Private Teacher with a demonstrated history of working in the primary/secondary education industry. Skilled in Music Education, Leadership, Concerts, Lessons, and Music Theory. 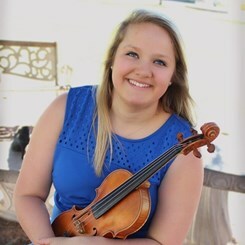 Violinist Raphaëlle Siemers is a Master of Music candidate at the Meadows School of the Arts at Southern Methodist University studying under Emanuel Borok. Raphaëlle began her violin studies early on and became an avid chamber and orchestral player. She attended numerous Music Festivals worldwide, including Harpa International Music Festival, Bowdoin International Music Festival, Villa Medici Masterclasses, and Montecito International Music Festival. Raphaëlle graduated from the prestigious Interlochen Arts Academy after attending for 3 years and received her Bachelor of Music at the Lamont School of Music at the University of Denver under the tutelage of Linda Wang and Mark Rush. Request Lessons with Raphaelle today!